MORE THAN 300 carolers took part in the festivities. 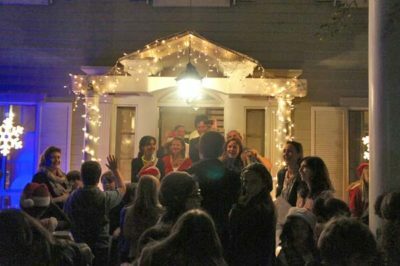 Neighbors took to the streets on the evening of Dec. 16 for the fifth annual Larchmont caroling party that was originated by Martha Adams, Kevin Cohen and Clare Sebenius. The event kicked off with hot spiced rum, candles and a rehearsal at the Adams’ home on N. Plymouuth. 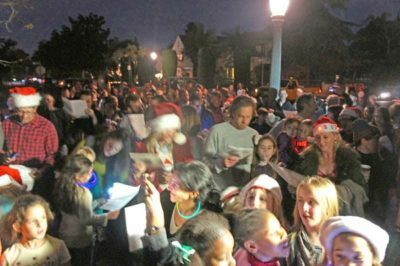 More than 300 carolers were led through the streets of Windsor Square by the New Orleans-meets-gypsy style band The Blasting Company. AREA RESIDENTS opened their doors to find hundreds of carolers singing holiday tunes. 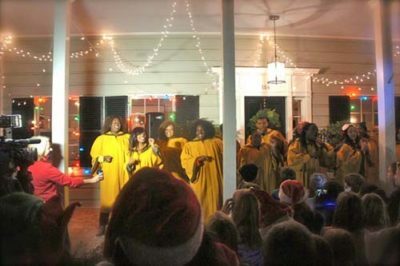 Gospel choir, Prazum, sang holiday songs at the home of Kim Swann and Rick Marlink. Later, they performed on the front porch of Cohen and Sebenius’s home, where sweet and savory treats were served. GOSPEL CHOIR Prazium delighted the crowd.